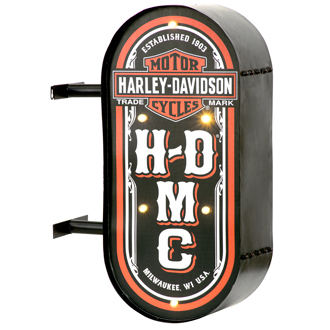 Brighten up your rec room or garage with the HDMC Marquee Pub Sign. Beefy, double-sided sign features distressed steel construction with hand painted finish. Complementary HDMC graphics accented with LED marquee bulbs will definitely get you noticed! Wall mount and indoor use only. Battery operated. Requires two AA batteries (not included). Remote control on/off switch (included).